San Francisco agencies are developing a wide-ranging program to streamline the funding and construction of improvements for walking, bicycling, and transit. Image via SFMTA. 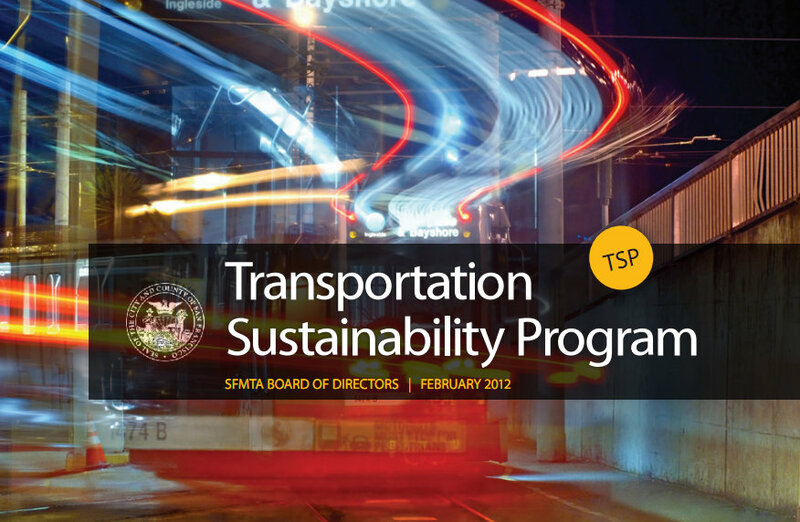 See ##http://www.sfmta.com/cms/cmta/documents/2-7-12item13transpsustainabilityprogram.pdf##full PDF here##. The Transportation Sustainability Program (TSP) would reform the city’s transportation practices in three key areas: by eliminating reliance on the automobile-centric measuring stick known as Level of Service (LOS), by instituting a system of development impact fees that fund sustainable transportation improvements, and expediting the review process for pedestrian, bicycle, and transit projects. The details are on the wonky side, but if the city delivers on these reforms, SF could be looking at a much more rapid build-out of transit corridors, bikeways, and pedestrian safety measures. “This program is taking a look at how we manage, regulate, and mitigate for development as it relates to transportation to develop a process that’s more transparent, equitable, and meaningful, and provides a much better nexus between land use planning and transportation,” said SFMTA Director of Transportation Ed Reiskin. SF Planning Department Assistant Director Alicia John-Bauptiste presented details [PDF] about the TSP Tuesday to the SFMTA Board of Directors. The program, currently planned for adoption in late 2013, is a coordinated effort between the SFMTA, the Planning Department, the SF County Transportation Authority, and the Office of Economic and Workforce Development. One key component to the TSP is the Transportation Sustainability Fee (TSF), which would replace the current Transit Impact Development Fee (TIDF) that building developers pay to the SFMTA to account for infrastructure costs due to car trips and transit trips made by users of those buildings. The TSF would be based on offsetting car trips added by a project, and its revenues could only be spent according to a spending plan to directly fund projects that improve transit service and bicycle and pedestrian safety. Developers would receive discounts on the TSF for building less car parking, and it would apply to residential buildings (except affordable housing), which the TIDF doesn’t. According to John-Bauptiste, many developments and transportation projects will also no longer be required to conduct an environmental impact report (EIR) as part of the California Environmental Quality Act (CEQA), which would lead to major time and cost savings. “Individual projects will be relieved of having to study cumulative transportation impacts because the TSP EIR will study those impacts. Project-specific analysis will be limited to site design issues such as loading docks, curb cuts, and pedestrian and bicycle safety,” the presentation says. The savings largely come from relieving planners of the need to measure projects using LOS, a tool that grades transportation projects based on how much they might slow down cars. LOS often calls for planners to take measures that “result in inconsistencies with achieving the city’s transit-first policies,” said John-Bauptiste. A recent cartoon about LOS by Andy Singer. Instead, the program would implement a new metric called Transit System Performance (formerly Automobile Trips Generated), which turns the LOS approach on its head by evaluating the transportation network holistically and focusing on reducing driving and improving conditions for transit, walking, and bicycling. This metric was developed as an alternative to LOS over recent years, and in 2009, San Francisco agencies successfully lobbied the state to allow cities to use alternative metrics. Under the TSP’s new environmental review system, projects would move so much faster that Reiskin said some improvements currently in development might get finished sooner by waiting until after the reforms are adopted. As another example, he pointed to the Transit Effectiveness Project (TEP), which Mayor Ed Lee has said is his #1 priority for Muni. The SFMTA is now at the outset of a 21-month, $2 million environmental review process for the TEP, said Reiskin. The TEP “is really about speeding up transit — a very clearly environmentally-beneficial initiative, but because we currently are under a Level of Service methodology… the TEP is subject to a full environmental impact report,” he said, though he noted that the TSP reforms won’t come soon enough for the project to take advantage. The SFMTA Board roundly praised the program, and directors Joél Ramos and Bruce Oka emphasized the urgent need to implement it. “Every month that we don’t have a policy like this in place, we stand to lose, who knows, millions of dollars,” said Ramos. Aside from the program’s cost savings, the TSF is expected to generate $630 million over 20 years and leverage $820 million more in other funding. The streams of revenue would fund “a comprehensive and strictly regulated $1.4 billion plan targeted at highly-efficient transportation system improvements,” according to the SFMTA presentation. Every two years, the city would dedicate funds to projects like the Market Street redesign, Muni’s TEP, Bus Rapid Transit on Van Ness and Geary, regional improvements like Caltrain electrification, the bikeway network, and pedestrian improvements. City staff are currently reaching out to stakeholders for the program. This month, they plan to introduce a legislative ordinance and begin conducting the program’s EIR, which should finish next summer. The program is set to be heard and adopted by the SF Board of Supervisors in fall of 2013. I guess I missed Tom Walsh comment on this story. The psychology behind how people like this editor have such a distorted sense of what really is causing problems in our society is amazing. It’s amazing how bias can completely blind you to the big picture. Shhhh! We don’t talk about that. It’s our little “secret” that cars kill orders of magnitude more people than bikes. Keep distracting the people with how bicycle “scofflaws” will be the end of civilized society. There is no need for statistics here, just base, biased emotion. There is a lot of good work that went into this proposal. I support eliminating LOS as a CEQA standard. I support the mitigation fee, at least as a development impact fee. Whether it should supplant transportation analysis in all cases is a real threat to Transit First. 1. In aggregating the development (new buildings, changes of use to existing buildings) impacts on transit into one big cumulative impact and mitigating that with the fee over time, there are risks. Absolving development projects of transportation analysis to determine transit delay means that we will not know of point source transit delay impacts and will not be able to mitigate them on a project level. Riders will need to trust in the agencies to mitigate transit delay in their neighborhoods, on their lines. Agencies might very easily use those mitigation dollars to speed up transit across town. In the interim, until the fee bucket fills up with enough money to pay for the first mitigation projects, transit will be delayed and that might elicit mode shift. Has that cascade been analyzed? 2. The TSP/TSF only analyzes transit delay based on ATG, auto trips generated, and has a fee structure based on parking spots alone. Missing from the program is any measure of warm bodies who will live and work in those developments whose presence in a Transit First city will put added load on transit leading to overcrowding that must be mitigated per CEQA statute. The program needs to account for both parking spaces as well as average residency or occupancy figures. The program proposes an up to 100% fee reduction based on parking numbers bounded by a $40m total discount over 20 years. How will that work out in reality? 3. The TSP/TSF solely (to my knowledge, got a call in on this) mitigates based on Planning Department and Building Inspection approvals and permits. It also exempts non-development projects from transportation analysis if they are off of major transit corridors. We learned with the bike plan that good ideas can have bad unintended consequences when certain bike plan segments delayed transit. Without any sort of consideration for the impacts of these non-development projects, SFPark demand management for parking space availability is another, then they cannot be absolved of their requirement to analyze transit delay and overcrowding impacts because the impacts have not been studied and mitigated by a fee with nexuses elsewhere. We do not know whether transit improvements themselves will have any unintended consequences for existing transit service. These systems are very complex and nobody can know the full extent of minor changes to large complex systems. That is why CEQA is there in the first place and that is environmentally beneficial. 4. LOS was not put into place as a social impact measurement tool. It was put into place during the era when 8 cylinder land yachts roamed the streetscape burning leaded fuel before emission controls. LOS was a proxy for air quality impacts. Emissions controls have evolved to the point where any given project was not going to be creating a toxic “hot spot,” but aggregating this over decades and not caring at all about auto delay is a different story. TSP/TSF has no component to replace the rationale for LOS, air quality due to delay to autos. CEQA is a very complicated area of the law, you are over your head in the weeds at the shoreline. This was initiated ten years ago to facilitate bike projects prior to the Bike Plan lawsuit. Since then we have learned that transit delay is indeed a legitimate environmental impact that demands consideration if we are to be a Transit First city. There is no free lunch when it comes to this. But this is not being driven by the SFBC, they are merely cheerleading uncritically and might well have shot themselves in both knees. Again. This is being driven by Planning which has contracted out all EIRs and added 40% to the time it takes to produce an EIR. Planning might have done this with the intent to instigate outrage at CEQA, to rally the development community around changing standards to streamline development at the expense of transit riders. Transit analysis should honed to the point where it is done by computer model and should all be done in house. Again, some good work here, I like where they say they intend to go, but the devil is in the details and the details are hidden deep in the weeds of some very complicated law. This sounds like a well thought out way to finally speed up the process of accomplishing any livable street improvement whatsoever. By international standards, it is pathetic how slowly progress is made in SF. A fix is sorely needed. There are so many great ideas and proposals to improve San Francisco’s livability that do not come to fruition. I hope the “TSP” isn’t one of them. Aaron, I’m disappointed that you did not make mention of the concerns raised by me, Marc Salomon, and David Pilpel. While I applaud the fee, I am concerned about the elimination of the requirement to do transit impact studies as part of the EIRs of future developments (one grand transit impact study would be done to account for projected development over the next 20 years). I testified that CEQA was a good law and that the TSP as it is now proposed would eliminate the ability of members of the public to comment on impact to transit of individual projects. The MTA CAC urges the Board of Directors and the Board of Supervisors to take steps to ensure that transit delay impacts of CEQA are hontred by having this TSP provide for mitigating projected transit delay impacts when and where they occur and not rely on a fee alone to mitigate aggregate delay impacts. The SFMTA CAC recommends to the MTA Board of Directors and the Board of Supervisors that all policy-based discounts be less than 100 percent. In other words, no projects, including affordbale housing projects and projects that have less than the allowable maximum of parking — or even zero parking — should be exempt from paying the TSF because all proejcts have an impact on transit, wither by adding people to the transit system or by adding cars to the roardways or both. If this program is not fixed in accordance with criticisms by those who support its intent, then TSP/TSF will end up as another Full Employment Act for Mary Miles, the last of which, the Bike Plan, ended up costing the City $300K and cyclists an untold number of injuries, when the City at the behest of the SFBC tried to get around the California Environmental Quality Act based on collective delusions of Groupthink. This will also speed up a whole host of other projects, namely crappy development, aside from livable streets projects that might diminish net livability. Be careful of developers and their planning department bearing what appear to be gifts. you just made his point. Streetsblog complained about the fact that this teenager, “only got 5 days in jail”, yet I haven’t didn’t read anything on this site about the fact that this 25 something adult who was too lazy to get up early, then too lazy to even slow down for a red light and finally negligently ran down and killed a pedestrian when he ran the this light, ended up getting ZERO jail time, ZERO. No but I read a lot of excuses why we shouldn’t care when cyclists routinely ignore even the simplest of laws, and a lot of complaints when the police actually enforce the laws. We all said he deserved a reasonable and applicable punishment. San Francisco has re-written transportation planning for the 21st Century. This will be the model that all vibrant urban centers follow in the future. This is coming up before the BoS next week. Will CPMC Pick Up the Slack for Street Safety in the Neglected Tenderloin?